End of The Rainbow – Trafalgar Studios to 21st May. Then touring and transferring to Broadway. Electrifying theatre. Tracie Bennett has the role of a lifetime here, and is clearly enjoying every second of her tour de force. The result is brilliant. A triumph. It is not often that theatre can take even the most enthusiastic of theatregoers’ breath away. About a month ago, one very clued up friend told me that Bennett’s was ‘the best female theatrical performance I have ever seen’ (with tears in her eyes). This was clearly not a show to be missed. As End of the Rainbow seems to demand the generation of quotable superlatives from my acquaintances, I’ll get on with repeating another – Tracie Bennet was ‘almost possessed by the spirit of Judy’ Anna Shields, 12th April 2011. I can’t help but agree. This examination of an attempted comeback tour by the drink and drug-ravaged Judy Garland as she neared her final marriage, and, 3 months later, her tragic death, does have a haunting quality. Propelled by a remarkable central performance, the stage presence and magnetism of an increasingly manic and irretrievable Garland are faultlessly captured. Bennett’s performance is a great piece of physical theatre. A ball of constant nervous energy, it is amazing to think that her performances can still be pulsing with such excitement as the run nears its 5th month (previews began 15th Nov 2010). Leaping around the stage with her tiny, bendable frame, the result is a series of momentary tableaus that are a hybrid of small child, hunchback and feline – perfectly capturing Garland’s confusion and trauma. Narrative-wise, the story could be compared to the fantastic La Vie En Rose as the singer’s personal demise acts as the background to performances of her classic and most involving songs. The music is interwoven seamlessly with the storyline, both as devices for exploring Garland’s perspective, and demonstrations of the development of her breakdown as the professional mask of the showbiz professional began to slip, revealing the train wreck that lurked beneath. Bennett’s Garland is impetuous, rude and childish, demanding attention and service from her few allies in classic diva style, yet never losing that sparkle in her eyes that made MGM a fortune and the world fall in love with her. The innocent young Dorothy – trapped in the narcotic bubble that has aged her so rapidly and stripped her of her sanity – is never far from the surface. Garland was one of the stars given pills such as Benzadrine by the studios (to maintain their productivity during hectic filming schedules and suppress their appetites) whilst filming The Wizard of Oz in 1939, at the age of just 17. As Bennett quips, she ‘could have flown down the yellow brick road’. The healthy plumpness of the youngster on her journey to meet the Wizard could not be further from the tiny, fragile woman portrayed here. The injustice of such an awesome talent being ruined by the demands of big-studio moviemakers is there for all to see. The rest of the cast must be desperately tired of getting only tiny mentions, but they do a great job of enabling this masterpiece by contextualising Garland’s mania. Hilton McRace was deservedly nominated for an Olivier for his role as long-suffering pianist Anthony, and Stephen Hagan also impresses – cleverly balancing the contradictions between Mickey’s ‘intentions’ and actions as Judy’s toyboy fiancee. The two very different men in her life are pivotal in demonstrating how the end of this story could have been so different had Garland made better choices or accepted more unconditional support. This shows the hope that still glimmered during this, her last chance to resurrect herself both as revered entertainer and a woman in control of her life. The end of the story is well known and obvious from the outset. That she will carry on accelerating until she crashes into the abyss is inevitable, but the fact that Garland was still only 47 years old when she was found dead in a Chelsea apartment is the horrible historical fact that hits home. Having thought that the run ended this weekend I was ready to start pinning down everyone I met in the street to make sure that they got to Trafalgar Studios by Saturday night. It seems that there is a little more time left to catch it, but don’t let that make you complacent. This is one of the best productions that I have ever seen in the West End and deserves to go down in theatrical history. I didn’t see Nancy Carroll’s performance that denied Bennet the title of Best Actress at the Olivier’s this year, but it must have been pretty spectacular to beat this. I’m not going to be polite about this. Just go. 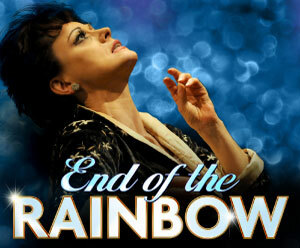 End of the Rainbow is at Trafalgar Studios 1 until May 21st 2011. Tickets have been available recently at TKTS (see Highly Recommended Links) for £27.50, but are only released to the discount seller on the day of the relevant performance. Groups of 8+ can get tickets for £29.50 each. Due to the small size of the theatre, there are very few seats that could be classed as restricted view, so don’t worry about going for seats right at the end of the rows. Enjoy!